If you’ve ever been lost in an unfamiliar city or tried to walk around in the dark, then you may have found yourself wishing you had the eyes of a cat or the echolocation abilities of a bat. But have you ever wished for the navigation abilities of a sea turtle? 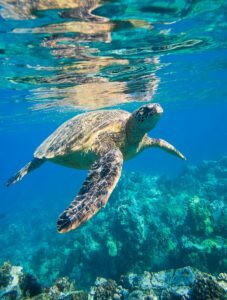 While many animals are known for their superb sensory perception which make them better navigators than humans, it may surprise you to hear that sea turtles are among the elite navigators of the animal kingdom. Sea turtles are able to cross entire ocean basins (covering distances of thousands of miles) surrounded by seemingly featureless, dark water in order to return years later to their original nesting grounds. This behavior is as perplexing as it is impressive: while we know that sea turtle navigation has something to do with sensing Earth’s magnetic field, the mechanism which enables them to sense and interpret magnetic fields has not yet been identified. To compare, humans have five senses. Each of these senses is linked to some kind of receptor which converts the environmental stimulus into a signal which our brains can interpret as either an image, a sound, a taste, a texture or a smell. For example, our eyes contain photoreceptors which convert light into electrical signals that travel to our brains and are interpreted as images. Sea turtles have another sense: they are able to sense magnetic fields. This means they must have some magnetic receptor which converts the magnetic field into a signal which is interpreted by the animal’s brain. However, scientists don’t know what these magnetic receptors are or where they are located within the body of a sea turtle. This is a crucial step on the path to understanding the impressive navigation abilities of sea turtles. Working in collaboration with biologists who study sea turtle navigation, my research project is to design and build a special imaging system which is able to locate these magnetic receptors in sea turtles. This project can be broken down into three parts: design the imaging system, develop a method for detecting magnetic particles, then build and test the hardware. High resolution- Because these receptors may be very small, we need high resolution to locate where they reside within the tissue. High magnetic sensitivity- If we want to detect very small magnetic particles, then our system has to be very sensitive to small amounts of magnetic material. Fast- Because we have to search through large volumes of tissue, we need a fast imaging system to do this in a reasonable amount of time. Non-destructive- Many existing imaging methods require the addition of dyes and other contrast agents which irreversibly alter the tissue. We would like to avoid this because sea turtles are endangered and finding dead sea turtle tissue to image can be challenging. So why can’t we use an imaging system that already exists? Although there are several imaging systems which are able to detect magnetic particles, none of them meet all four of our requirements. For example, magnetic resonance imaging (MRI) is very sensitive to magnetic material, but the resolution is not high enough for our aim. A microscope has really good resolution, but it can only image a very small section of tissue at one time, so the overall imaging speed is slow. In order to meet all four imaging system requirements, we use a relatively new optical imaging system called Optical Coherence Tomography (OCT). OCT is very similar to an ultrasound, the same technology used to produce fetal sonograms. Rather than using sound waves to form an image as in ultrasound, OCT uses light waves from a laser to create an image. By using light instead of sound, we shrink the scale of the imaging down so that our resolution is much better than that of MRI or ultrasound. By its nature, OCT is also non-destructive. OCT works by illuminating the sample we want to image with light waves. When the light hits the sample, it can either pass through the sample or it can bounce away (we call this scattering). OCT captures the light that is scattered back in the direction from which it came. We record this light on a camera along with light that was reflected from a stationary mirror in a process called interferometry. By comparing the light reflected from the mirror and the light back-scattered from the sample, we can tell how far the light travelled after it was scattered from the sample. This allows us to create 2D images of the sample. To get the desired magnetic sensitivity, I designed and built an electromagnet which can produce a sufficiently high magnetic force. We place this magnet over the tissue we want to image. By applying a current with a sinusoidally varying amplitude to the electromagnet, we create a magnetic field with a sinusoidally varying amplitude. This variation in the magnetic field strength causes the magnetic force felt by a magnetic particle to vary sinusoidally as well. Therefore, any tiny magnetic receptors in the sea turtle tissue we are imaging will oscillate up and down in sync with the applied magnetic force. As the magnetic particles oscillate up and down, they will cause the surrounding tissue to deform. This deformation causes a measurable change in the back-scattered light. We record a series of images while applying the oscillating magnetic force. We can then compare consecutive frames to identify any pixels whose intensity is varying in sync with the applied magnetic force and by doing so, locate the magnetic receptors (see Fig. 2). An OCT system combined with this method of magnetic particle detection is called magnetomotive OCT. Fig. 2 Schematic Diagram showing that when the magnetic receptors (black spheres) feel the oscillating magnetic force, they oscillate up and down creating a measurable change in the light reflected from the surrounding tissue. After designing and building the magnetomotive OCT system, we first had to test the system to ensure it met our requirements for resolution, speed, and magnetic sensitivity. We measured the resolution by imaging small, highly scattering particles and confirmed that we achieved our desired resolution. To test the imaging speed, we imaged human bronchial epithelial cells. These are the cells lining our airways which contain cilia and secrete mucus. The mucus layer acts like a shield preventing the bacteria we breathe in from entering our bloodstream. The cilia beat to propel the mucus (containing all those trapped bacteria) out of our airways and are a vital component of a healthy immune system. Therefore, the ability to image living, beating cilia is helpful to doctors who study respiratory diseases such as Cystic Fibrosis. Our collaborators in the Cystic Fibrosis Center at UNC provided us with a sample of these cells, and we were able to image the beating cilia. This was a very exciting result. Not only did we confirm that our OCT system has a fast imaging speed, but we also discovered that this novel imaging system may be useful for helping to diagnose and research respiratory diseases. Our imaging speed experiment using epithelial cells demonstrates a vital point in the scientific process: often, by setting out to answer one question, you may open avenues of investigation you had never considered. We demonstrated with this experiment that our OCT system has the best combination of high resolution and high-speed of any OCT system to date. We will next measure the magnetic sensitivity of our system by imaging tissue phantoms, silicone-based samples which mimic the light-scattering properties of biological tissue, containing increasingly small concentrations of magnetic particles. Once we are sure that our system has the desired magnetic sensitivity, we can begin imaging animal tissue. If we are able to locate the magnetic receptors, it would be a huge breakthrough in the study of sea turtle navigation. If we are able to find these receptors, biologists can study them to understand exactly how they are used to sense magnetic fields and how the turtles use that information to navigate. Building this novel imaging system is just one step toward finally understanding sea turtle navigation. In addition, we have also discovered that our technology may have other uses, as our preliminary work with the cilia suggest. We will continue toward our goal of detecting magnetic receptors in sea turtle tissue while also investigating the system’s applications in respiratory disease research. Peer edited by Allison Lacko and Laetitia Meyrueix.